The next few posts will be about the 9 official plug-ins released for Oblivion. These plug-ins can be bought off Bethesda’s online store (or Xbox Live for 360 players). PS3 players cannot get any other plug-ins other than Knights of the Nine, which is included in the PS3 version. All plug-ins (excluding Battlehorn Castle) were also released for PC in a retail box version. The first post is about the Horse Armour Pack. 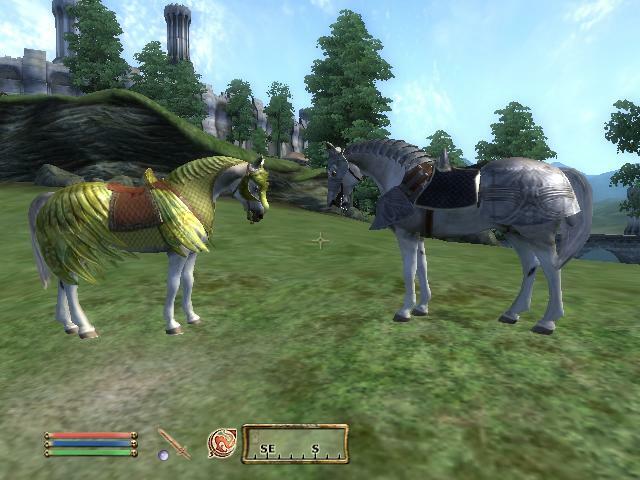 This was the first DLC released for Oblivion. 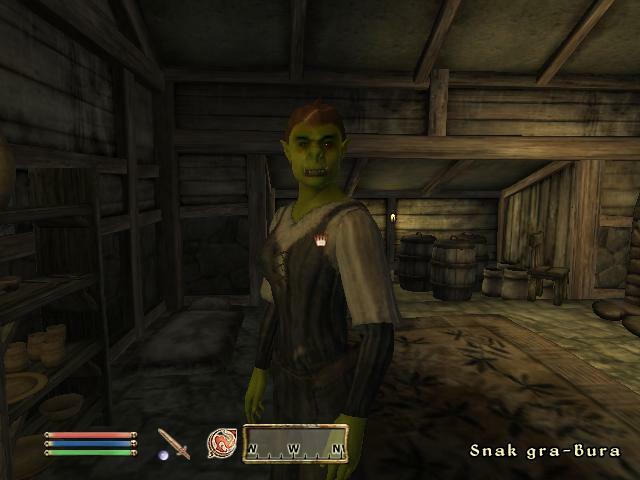 Upon loading the game, a note from Snak gra-Bura of the Chestnut Handy Stables appears in your inventory. If you present the note to her, she will armour your horse for free. There are two types of armour available – Elven and Steel. They offer an equal amount of protection, so it really only depends on looks. If you don’t have a horse or don’t want it armoured, you can get an “old nag” for free, armoured in steel. It’s the worst horse in the game though – even with armour it’s still weaker than the weakest breed. But if you want all the horses, you might as well add it to your collection. From now on you can get any horse you legally own armoured for 500 coins. But I highly recommend not armouring Shadowmere – she will lose her essential status and instead of returning to Fort Farragut she will stand around indefinitely. Besides, she won’t recieve any bonus from armour. All the armour does is increase a horses health, but Shadowmere’s is already maxed. Also, you can’t armour the unicorn. Be careful when deactivating this plug-in, as any horse you have armoured will be removed from the game, with no way to get them back (other than console commands). The plug-in also adds a bugged chest to the Cursed Mine, an old mine near Skingrad. Inside is a book entitled ‘Horse Armor Plans’. It has no icon and inside it simply says ‘I am a set of plans. Bring me to the Chestnut Handy Stables.‘ The book is a quest item and cannot be removed from your inventory, so it’s not a good idea to pick it up. Best thing to do is leave the chest alone (or disable it). Two white horses modelling the new armour. Sorry for the short post, but there’s not much else to write about this mod. The next post will be about the Orrery plug-in. In other news: As you can see, I’ve figured out how to take screenshots in Oblivion (just had to edit the ‘.ini’ file) so I’ll probably be updating my first Oblivion post with some pictures soon. Entry filed under: All, Oblivion, The Elder Scrolls. Tags: 500 coins, Bethesda, Cursed Mine, DLC, Elven, horse armor, Horse Armor Pack, Horse Armor Plans, horse armour, mod, modification, plug-in, plugin, screenshots, SHadowmere, Skingrad, Snak gra-Bura, Steel, unicorn. Heavy armor protects more but also encumbers more. As such, I logically assumed steel armor would protect the horse more but slow it down. Conversely, elven armor would protect the horse less, but not slow it down as much. From what I’ve read elsewhere online, this is not the case with the horse armor plug-in. Folks are saying Bethesda did a quick-n-dirty add-on that was more cosmetic than quality. I.e., the horse armor is merely cosmetic itself (boosting the health of all horses to the lesser of the armor perk or the max allowable  — and the boost is the same regardless of the selected armor type. If that’s true, it’s kinda fitting: quick-n-dirty cosmetic game design is horse manure.